It's usually the in-between moments that yield the best photographs. 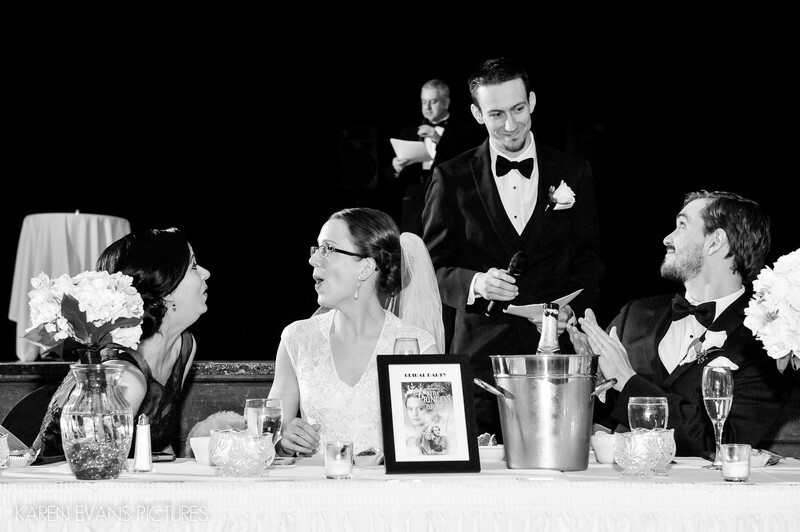 Shots of people talking during toasts and couples/guests reacting are all expected and pretty much the same unless you can come up with a different angle. I, however, like to focus on the moments in between the expected - where, in this instance, Becky learns that her sister had been hiding her favorite stuffed animal for their entire adult lives so she could surprise her with it at her wedding reception, and the moment between Jeremy and his best man. Add in, of course, the DJ in the background for just another layer of activity. It's these types of pictures that interest me the most and give the viewer lots of different elements to look at and wonder about.Keywords: columbus athenaeum (105), columbus athenaeum large theater (42), downtown (246).